Grantsville Auctioneer Mike Evans gets the bidding going for several trees and shrubs. 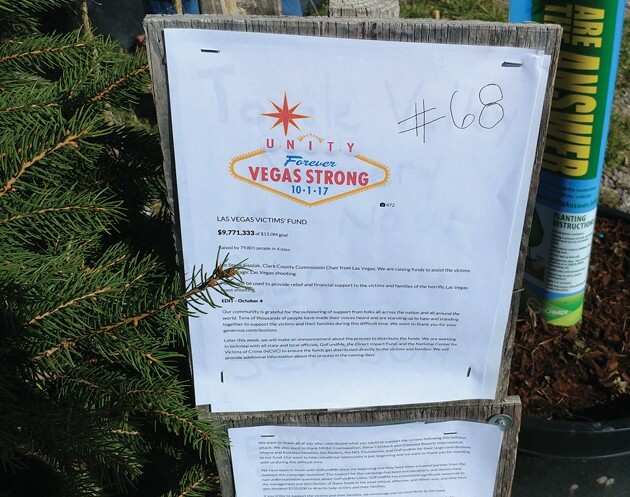 The Tooele Valley Nursery auction helped raise funds for victims of the recent Las Vegas shootings. As much as I’ve talked about the changing of the season and related activities, there’s one more to add to the list: when area nurseries need to clear plant shelves and tree areas and put everything away for winter. Whether the location is a national big box or a local enterprise, there’s a legitimate push to move out this year’s stock instead of overwintering it. Of course, annual plants aren’t going to make it. They are past blooming in most cases (mums are an exception), so demand for these types of plants is just about non-existent. But what about perennial plants and trees? Can’t they overwinter and be a part of what is sold the following year? Yes, they could be, but to do so has its trade-offs. First, we consumers are a fickle lot. We want fresh stock, with pristine bark and young growth. If something has overwintered, and toughened up to do so successfully, we tend to pass on a plant that has bark that went through the winter. 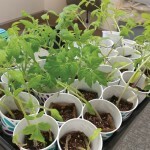 Frankly, year old and older stock won’t sell as fast as the new plants that just came in. Second, just because a plant is winter hardy doesn’t mean it will survive through the winter, or come out of the experience unscathed. Winter-kill on portions of the plant or tree can make it unsightly and unlikely to sell, or have to be sold at a reduced price, even though the cost of the plant has gone up because of the additional care and resources to overwinter it. Another factor is one that I learned the hard way: Cold hardy or not, if the root ball is not properly protected, it’s highly likely the roots will freeze and the specimen will die. Leaving trees out in pots exposes them to extreme temperature swings between night and day. Most items can’t cope with this. The answer is to provide insulation in the way of mulching, placing copious amounts of straw, or surrounding the trees with soil while still in their pots. 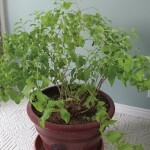 If you have lots of starts or trees in pots (like I do), you need to protect them, or you will have a bunch of lifeless sticks come next spring. I have a compact tractor with a front end loader on it, so my preferred method is to dig out a sizable depression in the ground about 16 inches deep. I place all of the trees and plants that I didn’t get planted into the hole, tightly grouped together. Then I put loose soil all over the lot and in between the pots as much as feasible. Finally, loose straw or leaves are placed on top, up to slightly below the surrounding ground level. Then, the whole group is watered well. This approach accomplishes several things. Putting the pots below the surface level and in connection with the underlying soil greatly slows down temperature fluctuations, and gets the plants out of the drying winter winds. As the temperature does drop when winter ensues, the roots can more readily adjust because there are no sudden moisture or temperature changes. Since there is a large mass of adjacent pots, and the soil under the pots, conditions will change much more slowly than if they were exposed on top of the soil. Do plants and trees need water in the winter? Yes! A significant amount of tree root growth occurs in the winter. Even though these are potted plants and trees, they greatly benefit by having water available and staying hydrated over the winter. And, because they are situated in a depression, water will collect at the bottom, as well as the snow landing on the mulched top. This provides additional insulation and moisture on warm days and as spring approaches. A couple more things: I place this set up where there is a southern exposure so there is good light and warmth that allows the plants to activate healthily when the warm weather returns. Also, I mentioned that I place the mulch on top of the pots so that it is slightly lower than the surrounding soil surface. The mulch will stay in place better during high winds, and create a natural depression for snow and water to collect. You can see that there is significant effort required to successfully overwinter nursery stock. It’s not too difficult for small batches, but when you are a commercial nursery, the scale of work can be daunting. Besides, come spring time, when the new stock comes rolling in by semi loads (seriously), having a clean slate to work with sure makes the set up a lot easier. For these reasons (and a whole lot more! ), I think my friends Wade and Regina Anderson at Tooele Valley Nursery are pretty darn clever. Regular readers of this column know how many times I’ve referred to their advice or knowledge. They’ve been a great resource to many gardeners and landscapers in the valley, including this one. 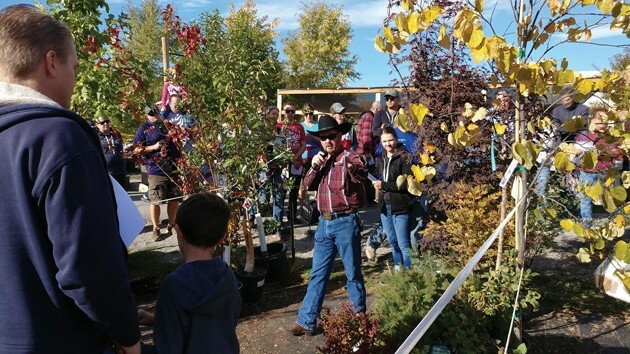 The Andersons have successfully created an annual event that brings the gardening community together and allows all the remaining stock in the nursery to find a home before winter hits. 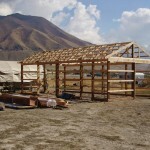 Tooele Valley Nursery now has a true no-reserve auction every October. If my memory serves me correctly, Oct. 7 was its third auction. Maggie and I went the previous day to pick up a listing and preview all the lots. Even if I had not bought anything the following day, this nursery walk-through was enjoyable and I saw new plants and learned things that I would not have otherwise. In fact, there are some new plants on my want list from the nursery next year as a result. Resourceful people, those Andersons! The following day, we were the top bidders on two lots, and those trees and shrubs are being planted in the next few days. We will add six new trees to our yardscape, and about that many colorful shrubs as well. They were a good buy and will add further diversity around here. The event was the real thing, with auctioneer Mike Evans of Bar-Dot-Bar Auctions out of Grantsville, leading the proceedings. He had a wonderful demeanor, and sparky sense of humor that kept things running smoothly. When you can work through 132 lots in about 3 hours, and do it with panache to keep the crowd engaged, that’s a skilled and energetic auctioneer. This will now become an annual event for us — it’s that good! Even if I never successfully bid on a lot at a future auction (that ain’t gonna happen! ), the community experience and conversations we had were over the top. There was a lot of friendly competition among those in attendance, the weather was beautiful, and the setting was a real spirit lifter. I’ve driven by the nursery several times since. All the stock is gone, and that’s a good thing. All those great plantings have homes and the facility is ready for next year’s new arrivals. The Andersons can attend to other things for the winter months, and perhaps take a bit of a break. But, I have to admit, I’m a bit sad. It’s tough to see the place empty at the end of the growing season. It’s hard to let go. I suppose that’s a good thing — to have a pursuit that is so enjoyable that it’s difficult to shut it down for a time. Nonetheless, I know that it won’t be too long until I see those delivery trucks rolling in, and the nursery grounds will once again be overflowing with beautiful greenery and colorful blooms.